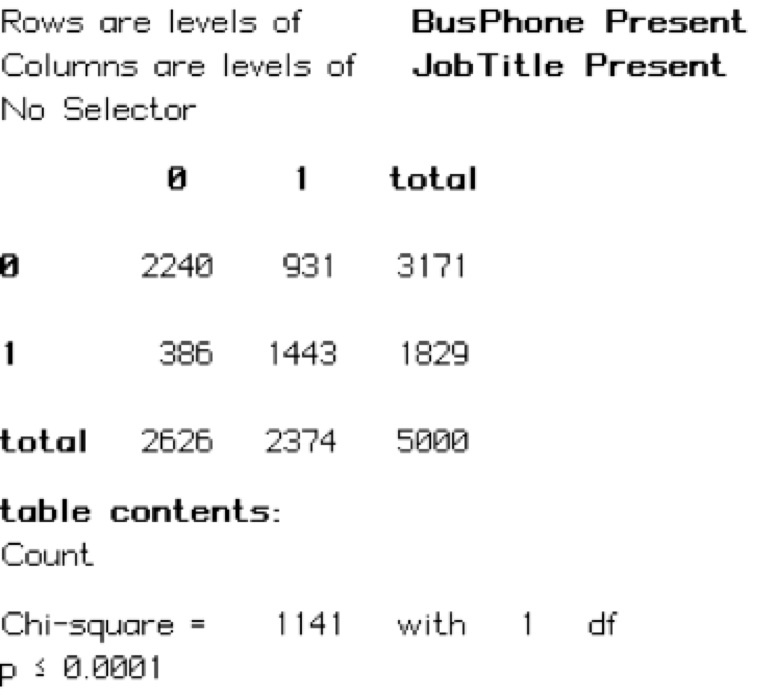 Some of the best predictors in my models are related to the presence or absence of phone numbers and addresses. For example, the presence of a business phone is usually a highly significant predictor of giving. 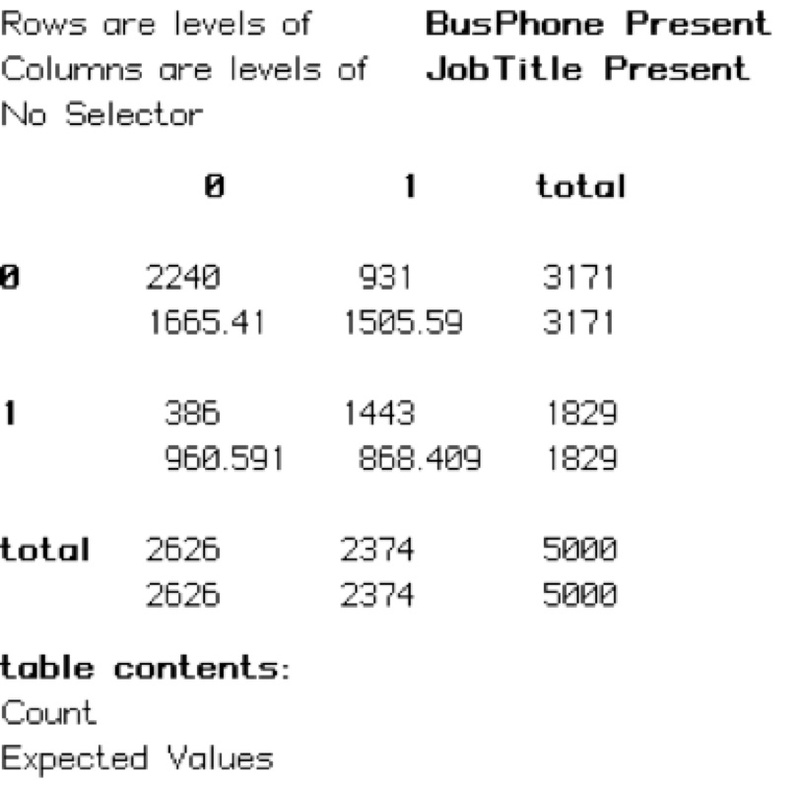 As well, a count of either phone or address updates present in the database is also highly correlated with giving. Sometimes this objection comes from someone who is just learning data mining. Then I know I’m dealing with someone who’s perceptive. They obviously get it, to some degree — they understand there’s potentially a problem. I’m less impressed when I hear it from knowledgeable people, who say they avoid contact information in their variable selection altogether. I think that’s a shame, and a signal that they aren’t willing to put in the work to a) understand the data they’re working with, or b) take steps to counteract the perceived taint in the data. 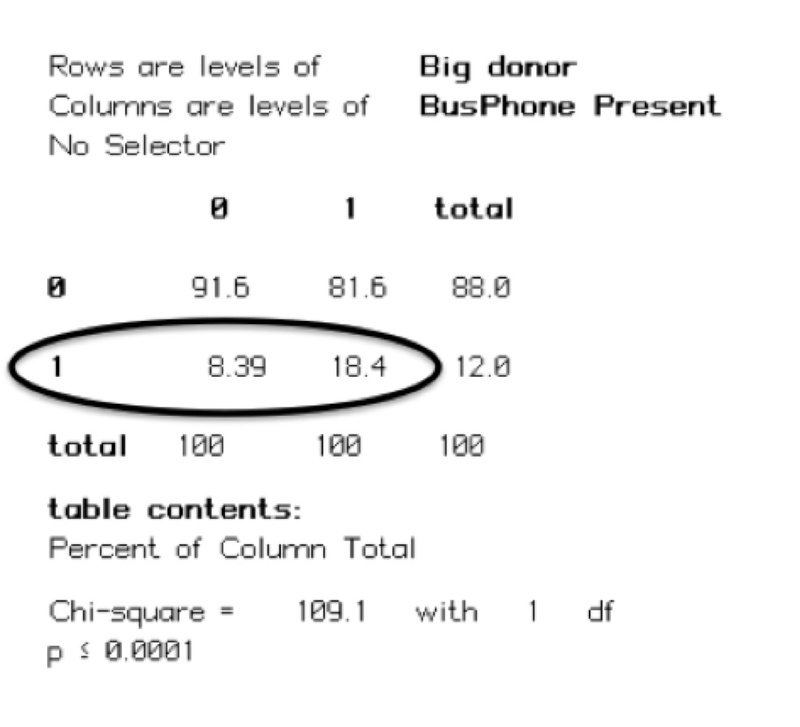 If the majority of phone numbers or business addresses or what-have-you are present in the database only because they came off donors’ cheques, then you’re right in not using it to predict giving. It’s not independent of giving and will harm your model. 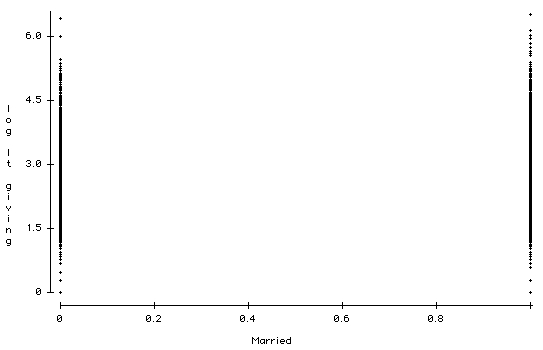 The telltale sign might be a correlation with the target variable that exceeds correlations for all your other variables. If the information could have come to you any number of ways (with gift transactions being only one of them), then use with caution. That is, be alert if the correlation looks too good to be true. This is the most likely scenario, which I will discuss in detail shortly. If the information could only have come from data appends or research, then you’ve got nothing much to worry about: The correlation with giving will be so weak that the variable probably won’t make it into your model at all. Or it may be a negative predictor, highlighting the people who allowed themselves to become lost in the first place. An exception to the “don’t worry” policy would be if research is conducted mainly to find past donors who have become lost — then there might be a strong correlation that will lead you astray. An in-house predictive modeler will simply know what the case is, or will take the trouble to find out. A vendor hired to do the work may or may not bother — I don’t know. As far as my own models are concerned, I know that addresses and phone numbers come to us via a mix of voluntary and involuntary means: Via Phonathon, forms on the website, records research, and so on. I’ve found that a simple count of all historical address updates for each alum is positively correlated with giving. 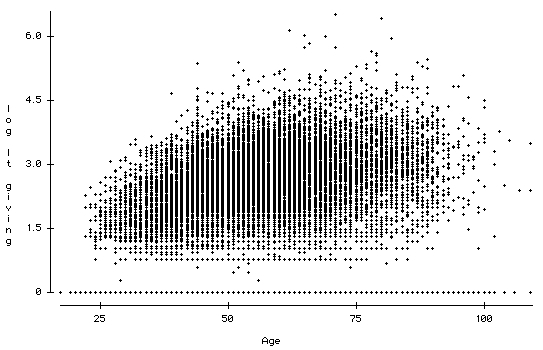 But a line plot of the relationship between number of address updates and average lifetime giving suggests there’s more going on under the surface. Average lifetime giving goes up sharply for the first half-dozen or so updates, and then falls away just as sharply. This might indicate a couple of opposing forces: Alumni who keep us informed of their locations are more likely to be donors, but alumni who are perpetually lost and need to be found via research are less likely to be donors. If you’re lucky, your database not only has a field in which to record the source of updates, but your records office is making good use of it. Our database happens to have almost 40 different codes for the source, applied to some 300,000 changes of address and/or phone number. Not surprisingly, some of these are not in regular use — some account for fewer than one-tenth of one percent of updates, and will have no significance in a model on their own. For the most common source types, though, an analysis of their association with giving is very interesting. 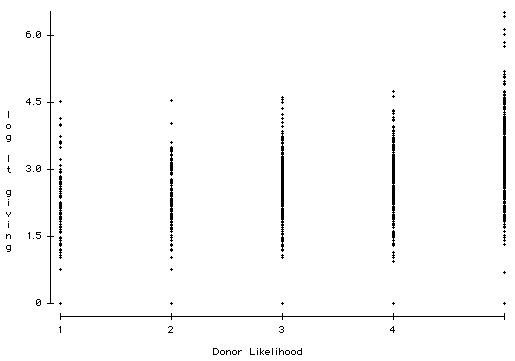 Some codes are positively correlated with giving, some negatively. In most cases, a variable is positive or negative depending on whether the update was triggered by the alum (positive), or by the institution (negative). On the other hand, address updates that come to us via Phonathon are negatively correlated with giving, possibly because by-mail donors tend not to need a phone call — if ‘giving’ were restricted to phone solicitation only, perhaps the association might flip toward the positive. Other variables that I thought should be positive were actually flat. But it’s all interesting stuff. For every source code, a line plot of average LT giving and number of updates is useful, because the relationship is rarely linear. The relationship might be positive up to a point, then drop off sharply, or maybe the reverse will be true. Knowing this will suggest ways to re-express the variable. I’ve found that alumni who have a single update based on the National Change of Address database have given more than alumni who have no NCOA updates. However, average giving plummets for every additional NCOA update. If we have to keep going out there to find you, it probably means you don’t want to be found! 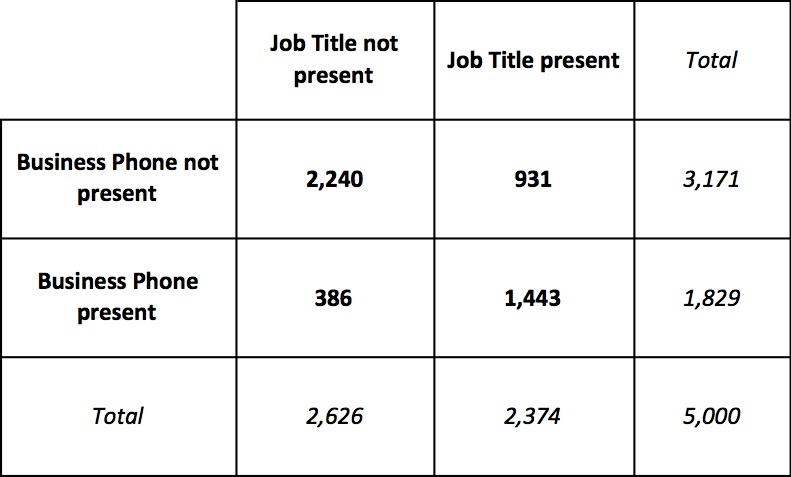 Classifying contact updates by source is more work, of course, and it won’t always pay off. But it’s worth exploring if your goal is to produce better, more accurate models.